Seagrass habitat plays an important role in maintaining a diverse and healthy coastal ecosystem in Florida. Unfortunately, this valuable habitat is threatened by human activities. Coastal runoff from nearshore construction and agricultural projects, storm runoff from cities, dredging operations, and micro-algal blooms can reduce the amount of light reaching the plants and may even smother them. Additionally, off-course boaters may rip giant "blowholes" into seagrass formations. 1. They stabilize the sea bottom with their roots and rhizomes in much the same way that land grasses retard soil erosion (often important when storms approach our coastlines and threaten Florida beaches, businesses, and homes). 2. They help maintain water clarity by trapping fine sediments and particles. 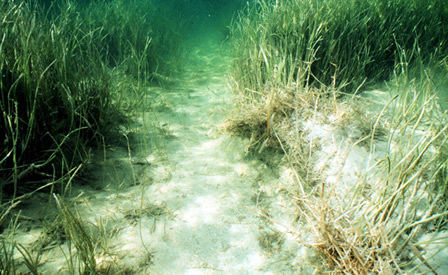 Bottom areas without seagrass are more often stirred up by wind and waves decreasing the water clarity and affecting marine animal behavior and recreational quality of coastal areas). 3. 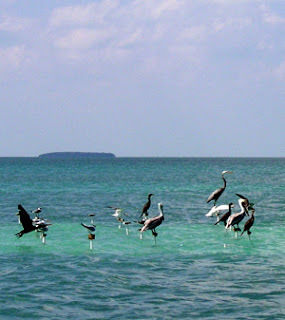 They provide habitat for many species of fishes, crustaceans, and shellfish. 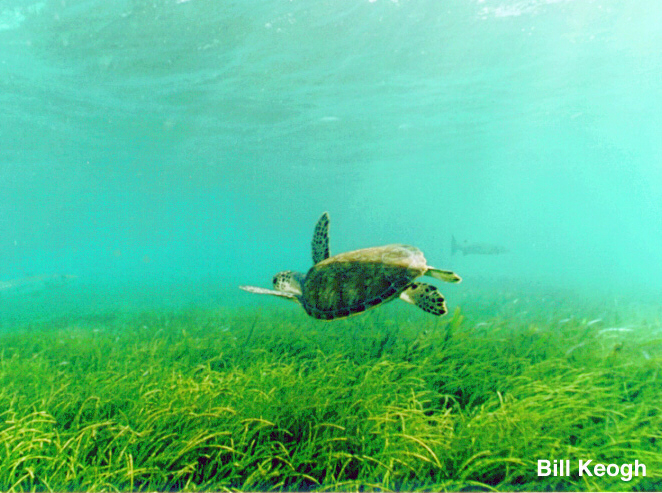 Research has shown many species are dependent on seagrass meadows for habitat. 4. Seagrasses and the organisms that grow on them are food sources for many animals, including wild manatees. 5. They are nursery areas for much of Florida's recreationally and commercially important marine life. Operating a boat in water that is too shallow can result in propeller scars and blowholes. Propeller scars are created when the metal propeller, spinning at thousands of revolutions per minute, cuts deep into the root and rhizome system of the plants, leaving a furrow that can stretch across the grass bed. A depression called a blowhole forms when the boat operator grounds the boat and then tries to "motor off" using the engine. The engine not only digs in a circular shaped blowhole, but forces sediment into a pile or berm that covers and harms nearby grasses. Blowholes and prop scars can take as long as seven to ten years to heal, primarily because seagrass plants are not capable of growing downward, away from light, into the damaged area. Currents can also wash away loose sediments and prevent the establishment of new plants. Repeated damage from boaters over time can result in habitat fragmentation and the erosion of the entire banktop. To address the loss of seagrass habitat due to boating impacts, scientists have developed techniques to repair damaged areas. The first step in the restoration process is to fill the scar or hole so that it is level with the surrounding area. Small rocks and gravel are used to fill the holes and scars first and a layer of finer sediments is placed on top. Shoal grass shoots are then carefully transplanted to the site. In time, this fast-growing species stabilizes loose sediments and promotes the establishment of the slower-growing climax species like turtle grass. In some sites, "bird stakes" are used in the restoration process. The relatively small T-shaped stakes, which are attractive bird perches, are pounded into the sediments along the length of the prop scar. The use of stakes to attract birds provides a natural way to fertilize seagrass beds as bird feces are high in nutrients needed by the growing seagrass. After one or two years, when the grass plants have established themselves, the stakes are removed to prevent over-fertilization of the site. Rather than leaving the site to recover on its own, restoration activities have significantly reduced the amount of time required for damaged seagrass beds in the monitoring area to recover. There are currently more than 30 seagrass restoration projects are underway across Florida, many of them in the Florida Keys National Marine Sanctuary. The Marine Sanctuary protects over 2,900 square nautical miles of critical marine habitat, including coral reef, hard bottom, seagrass meadow, mangrove communities and sand flats. With the newly elected administration in Florida threatening to make severe cuts to environmental restoration projects as well as a legislature that is largely apathetic to environmental causes, it is important for citizens to let their voices be heard. Please sign the petition and consider Becoming a Member of Save Our Shores! Florida today. I am an avid Florida vacationer, but since the environment keeps getting destroyed by humans, I have less and less interest in visiting the state. Florida works so hard at adding entertainment attractions, but don't look to their state's natural beauty the bring in visitors! I want to go to Florida for the beauty that is the Florida I remember growing up. I didn't hear about red-tide problems where I would stay when I was little. I would see the seagrass and manatee and other animals I would have trouble finding elsewhere. It's a state of natural wonderment, but it's slowly disappearing. Seagrass is a vital part of the aquatic environment of Florida, and necessary for all the unique wonders of Florida to survive and thrive. I vow to not visit Florida again until the state government sees the error in their ways of neglecting and ignoring their beautiful environment. I have been living in florida for the last nine years. I have always been a avid fisherman and have noticed a decrease in the seagrass. I spend my summers in Melbourne Beach and have noticed the seagrass disappearing in more than one place. In 2004 the seagrass was all over behind our development and was gone the next summer. (the fish went with the grass) Now I have found that it has disappeared from two of my other favorite fishing spots. One in Cocoa and one in Sebastian. i think that people should not harm seagrass should be a law!! bacause the number of saegrass that dies is way to much!! I agree with all of you! this is too much that Seagrasses are harmed and they should have a law for that!!! خدمتنا الان متوفرة وباقل الاسعار الممكن من صيانة تكنوجاز التى تقدم افضل العروض والخصومات وايضا لدينا افضل صيانة فى مصر صيانة باناسونيك التى تقدم افضل ما لديها الان .